When I first entered the Gaia Online web site, I did not like much of what I saw. Despite having watched my nephew play the game many times, I could not see this free MMORPG’s appeal. It seemed to be another web games portal linked to several chat rooms. What I could not figure out is how the game counted as a free MMORPG, but a little more exploration of what Gaia Online offered forced me to reconsider my position. This new browser-based MMORPG scores higher marks than its competition in many areas, especially with its graphics capabilities. Movement through the world may be two dimensional, but the fun, quirky nature of the game's multiple settings serve as a pleasant diversion. many forums. It is also, despite my earliest impressions, an MMORPG. Gaia Online is similar to both Second Life without the user-generated content and also more traditional free MMORPGs, such Jagex’s popular Runescape. With over 60,000 users, Gaia Online may soon eclipse its older competition. All of these impressions are correct because the game can be played in multiple worlds that can appeal to different styles of gamers. Runescape fans can fight monsters (or inanimate objects, as the case may be) in the zOMG world, explore several towns in the game, or chat in some of the virtual worlds with different sponsors whose domain will be expanded as the designers add more code. The user has a small set of character customization options when he creates an avatar. He can purchase new clothes from shops accessed from the game’s web site. Completing certain tasks or killing monsters earn a player gold, but people who are in a hurry can purchase Gaia cash and save tedious farming time. Why is this different than Second Life? Second Life provides a virtual chat room. Linden Lab's mmo appeals more to women and a few politicians trying to be technically savvy. Gaia Online has not as of yet, attracted many women, but it has attracted diverse groups of teenagers. It has become a fierce competitor to Jagex's Runescape. Gaia Online has one advantage Runescape does not. Users can upload their own flash world and do not have to explore a specific fantasy world. They can add their own genre, a feature which a few advertisers have exploited to promote their product. Why is this Free MMORPG Popular? The anime style of Gaia Online may not appeal to everyone, but fans of Phantasy Star II and IV should appreciate its artwork. 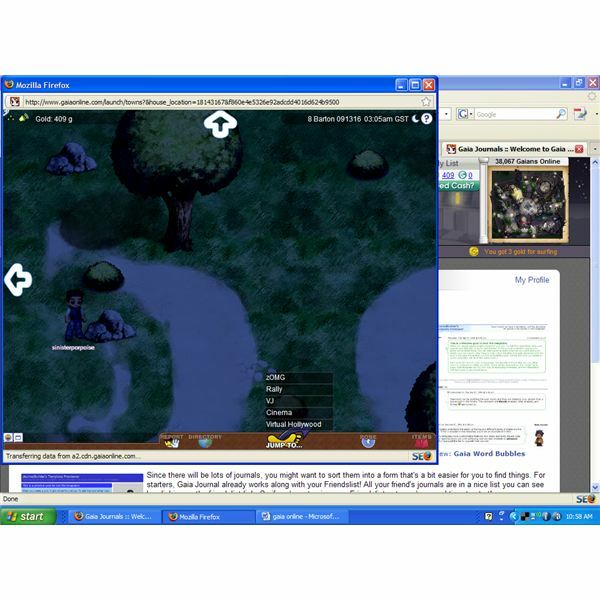 Most free browser-based MMORPGs suffer from poor graphics or game play that relies too much on the numbers. The creators of Gaia Online understand that the video game is a visual medium and players should receive most of the game information in a visual manner. cially if the developers decide to allow user-generated content. blem this fledgling game suffers from is its split personality. Everything a character can do that affects the game world that he plays in should be able to be done from that world, as it is in most MMORPGs.MMORPGs game worlds expand, this may turn out to be one of its strengths. Most users like myself would like to think their home actually exists somewhere in the world that their character inhabits, not, as it seems, in a separate pocket dimension that accesses a shopkeeper in another pocket dimension who always wants to sell furniture to my character. There are times when the game performance lags, particularly when moving between load screens, but this delay results more from Adobe Flash player’s limitations than problems inherent in the game's software. The game beats out Runescape, its primary competition, on many levels. The graphics are on par with the long-dead Sega Saturn, which shows the artists and graphic designers did a fantastic job of making the game look good on systems with limited hardware capability. No one will play this game to replace a commercial MMORPG, but fans of anime, manga, or just quirky games will not be disappointed. If a player does not want to spend his time killing monsters, he or she never needs to enter the world where that occurs and can use the towns and sponsored worlds as a place to hang out online. The indecisiveness of the shop design and the confusing interface for purchasing items earns Gaia Online a rating of 3 stars out of 5. Since this review was written, Gaia Online has almost become the 'facebook' of MMOs. Forums allow people from differing backgrounds to connect. It remains popular with teenagers and has a small adult following. Your guide to Gaia Online for Facebook. Gaia Online Review: Is this Free MMORPG Worth the Time?